We have heard through the grapevine Leo Vegas online casino have teamed up with NYX Gaming to release a hybrid casino game combining two popular card games. Mixing our favourite game, blackjack, with the popular card game of poker, LeoVegas.com and NYX Gaming have created an interesting hybrid title. The game, known as 21 Heads up, is a result of the team at LeoVegas being inspired by the poker player and Olympic wrestling champion, Frank Andersson. We aren’t quite sure as to the exact release of this new and exciting game, but we will keep an eye out for any new information and you will be the first to know here when we have more details. For now, you can play the huge variety of blackjack games available at Leo Vegas, including a new addition called Perfect Pairs/ 21+ 3. Leo Vegas employs a number of software developers and as such offers a substantial blackjack catalogue, featuring a recent new addition. Perfect Pairs/ 21+ 3 is a fairly new addition to Leo Vegas online casino from Realistic Gaming and is based on a standard game of 21 but with the additions of extra bets. 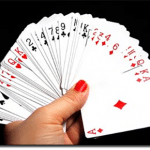 These include wagering on the first cards being a pair – mixed, coloured or perfect – or on the first two cards plus the dealer’s card creating a poker hand – straight, straight flush, flush, 3 of a kind, or suited 3 of a kind. 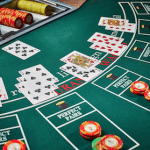 Standard blackjack gameplay is offered too, with the minimum bet of $1, and the maximum bet of $2500 on offer. For players after a low limit standard blackjack title we recommend Blackjack Single Deck Pro, with low stakes. 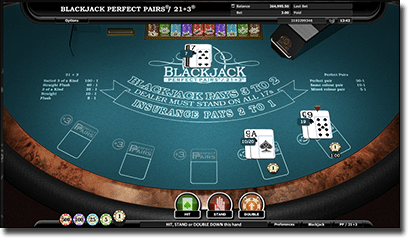 The minimum bet available is $0.10, while maximum bet available is $5 and the game is played with just one standard deck meaning a low house edge of 0.48% (when playing the perfect basic strategy). You can also get medium and high table limits with this variant, too. While you’re waiting for the release of 21 Heads Up, head on over to LeoVegas.com for the best real money online blackjack games on your desktop computer or mobile device.